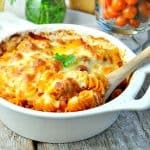 Comfort food in just minutes! 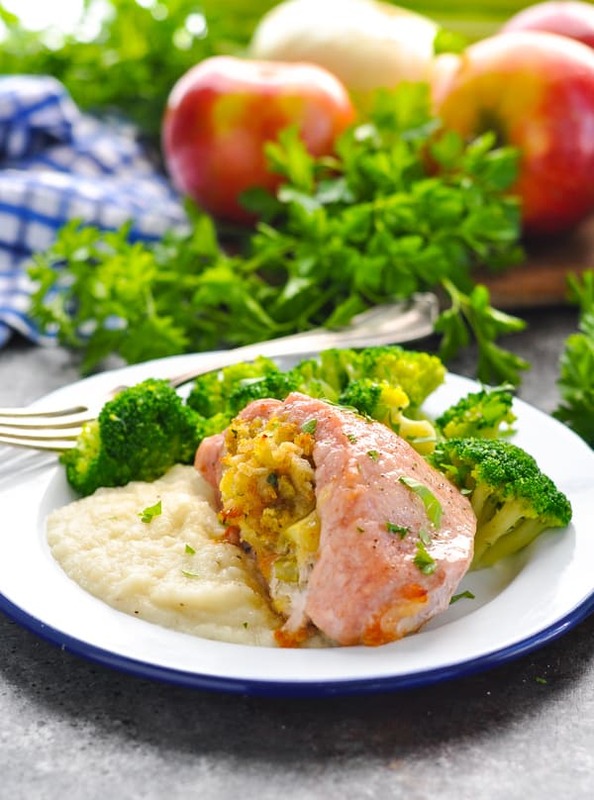 These baked boneless Stuffed Pork Chops with apples and Stove Top Stuffing are a cozy and easy dinner recipe that the whole family will love! If you’re tired of your regular ole’ pork chop recipe, then you’ve come to the right place. 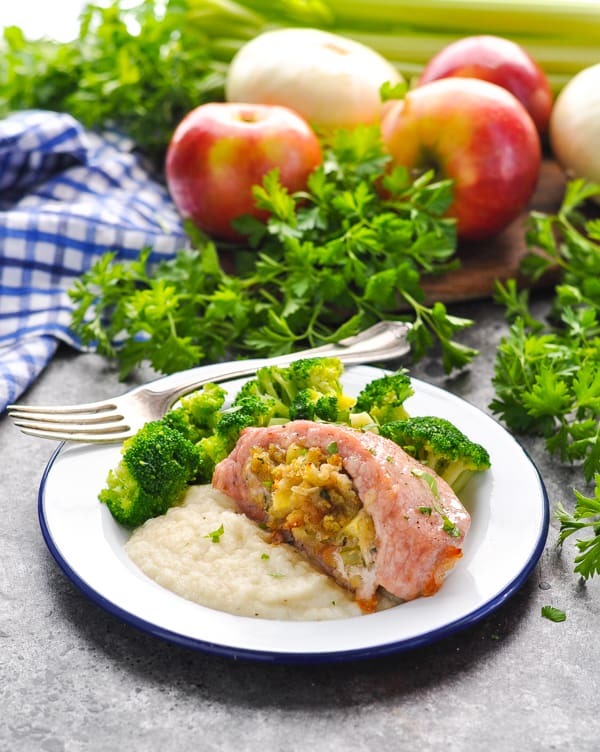 These apple stuffed pork chops are full of flavor and they look impressive — but they only require about 15 minutes of prep! 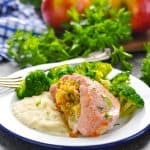 Served with mashed potatoes or mashed cauliflower and a green veggie, the baked stuffed pork chops are a wholesome and satisfying meal to warm you from the inside! 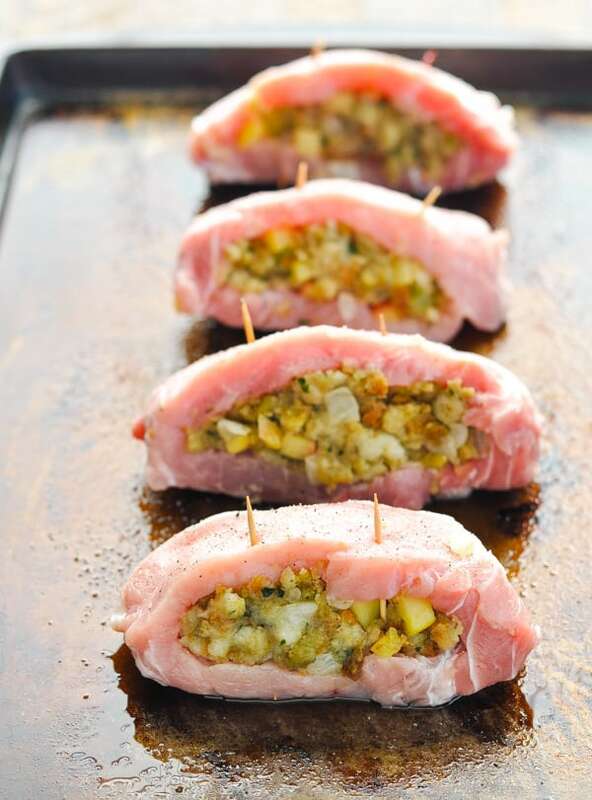 These stuffed pork chops with Stove Top stuffing only require a few minutes of prep before they go in the oven! Let’s start with the stuffing. You’ll need finely diced apple, onion, and celery. 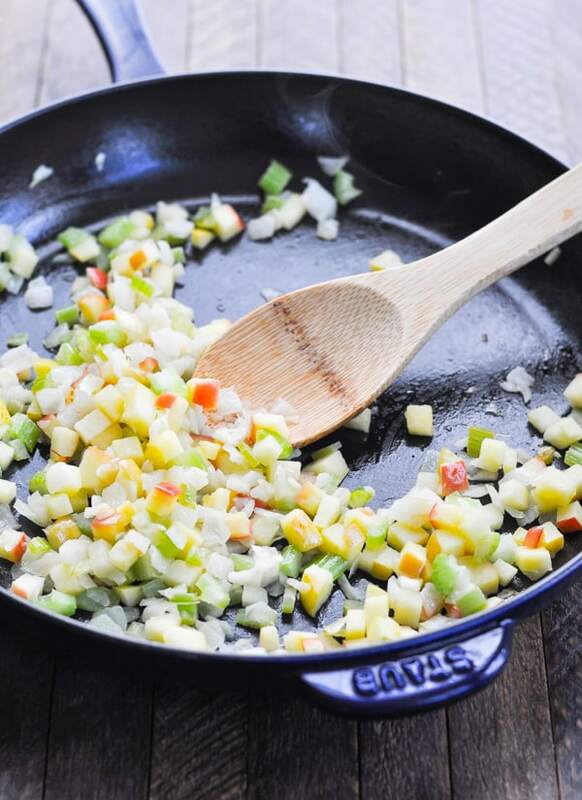 Melt 1 tablespoon of butter in a large skillet and saute the apple, onion and celery until tender (about 5-7 minutes). 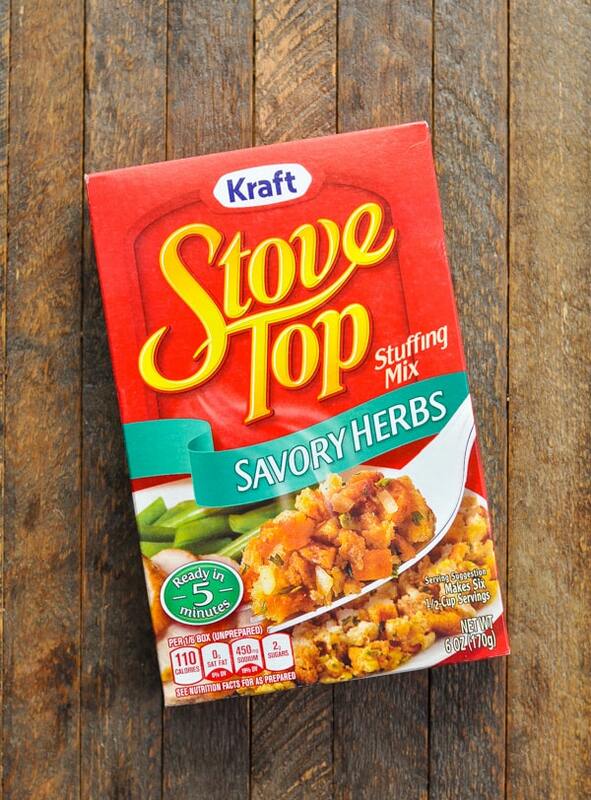 While the veggies cook in the skillet, prepare the Stove Top stuffing according to the package instructions. 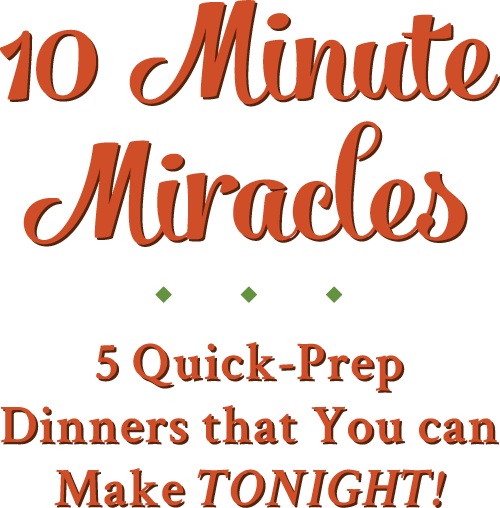 I use the microwave method, which only takes about 5 minutes! 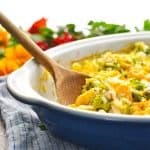 Combine the cooked vegetables from the skillet with the prepared stuffing, and then set it aside to cool for a few minutes while you prepare the pork chops. You’ll need to cut a pocket in each pork chop so that you can stuff it with the filling. Use a sharp knife and cut almost to the far edge, making the pocket as large as possible. Thick pork chops are the way to go! Then simply stuff each pork chop, secure with toothpicks, and place the pork chops on a baking sheet. How long do you cook a Stuffed Pork Chop? These stuffed pork chops bake in a 350 degree F oven for 35-40 minutes, or until the internal temperature of the meat reaches 145 degrees F.
What goes with Stuffed Pork Chops? I’ve shown these pork chops with a side of mashed cauliflower (just the frozen, microwaveable version is great!) 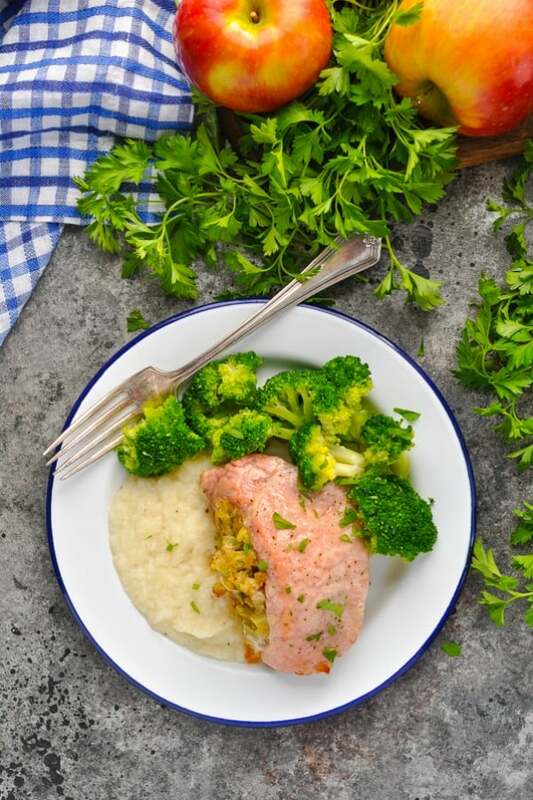 and some steamed broccoli, but you can serve the pork chops with just about any side dishes that you enjoy. 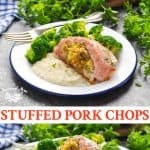 Can Stuffed Pork Chops be frozen? Sure! 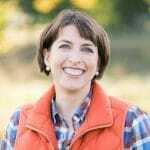 If you prepare a large batch, you can wrap the leftover baked stuffed pork chops tightly with plastic wrap or foil and keep them in the freezer for up to 3 months. To reheat, allow the pork chop to thaw in the refrigerator overnight. Warm in a 350 degree F oven, just until heated through. 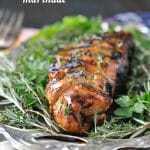 I used boneless pork chops here, but you can substitute with thick bone-in pork chops instead. 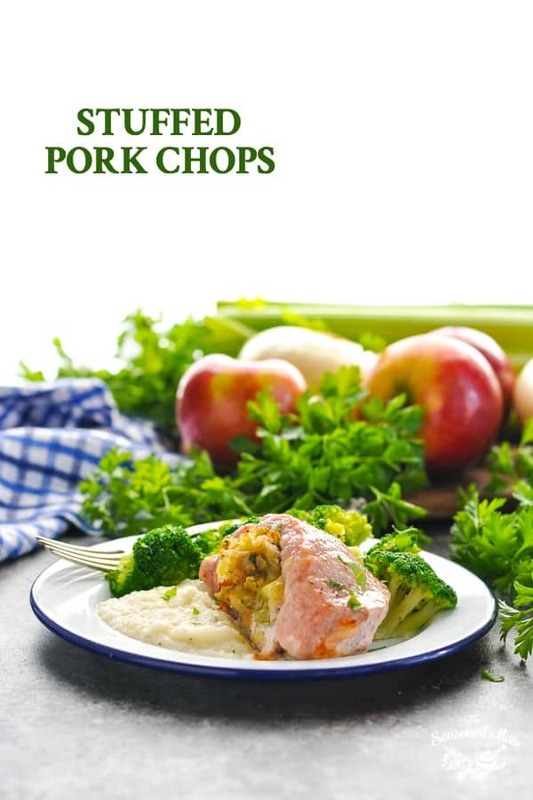 If using bone-in pork chops, you will need to increase the baking time to 45 – 55 minutes. 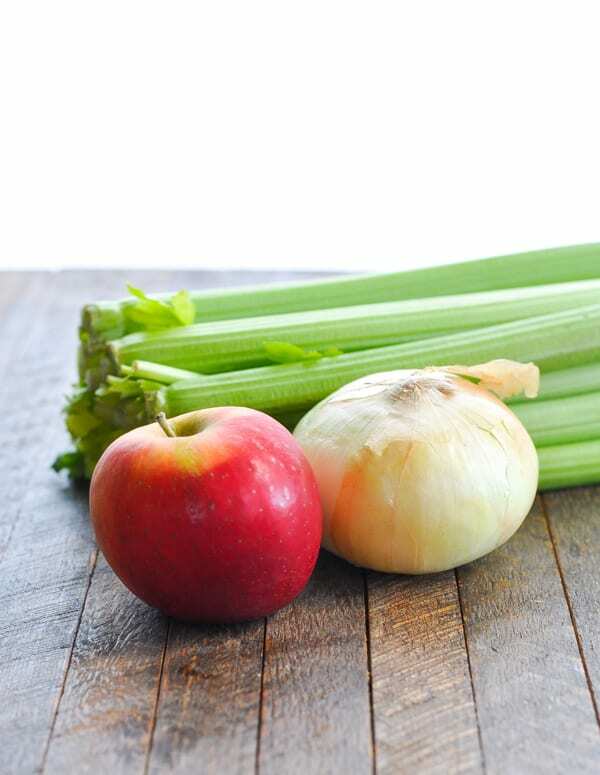 Be sure to finely dice the apple, onion, and celery. You don’t want big chunks, which will be harder to stuff in your pork chop. This recipe yields enough stuffing for about 8 pork chops. If you’re only preparing 4 pork chops, you can serve any extra stuffing as a side dish with your baked pork chops. Just warm it in the microwave right before serving, if necessary. 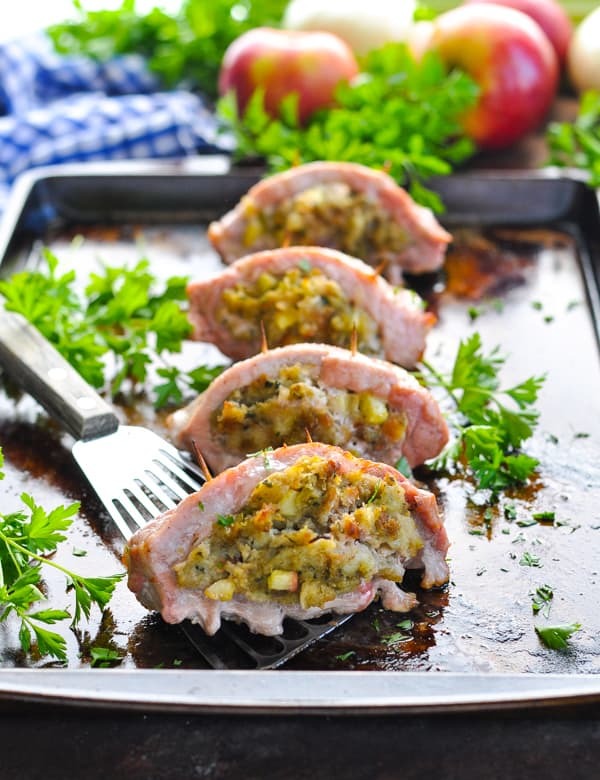 These stuffed pork chops are made with Stove Top Stuffing. I chose the “Savory Herbs” flavor, but you can substitute with any stuffing flavor that you prefer. I’ve shown you how to make stuffed pork chops in the oven, but you can also prepare these stuffed pork chops on the grill! How to grill stuffed pork chops: assemble the pork chops as instructed, securing with toothpicks. Grill, covered, over medium heat for 4-5 minutes on each side (or until a thermometer inserted in the meat reads 145 degrees F). 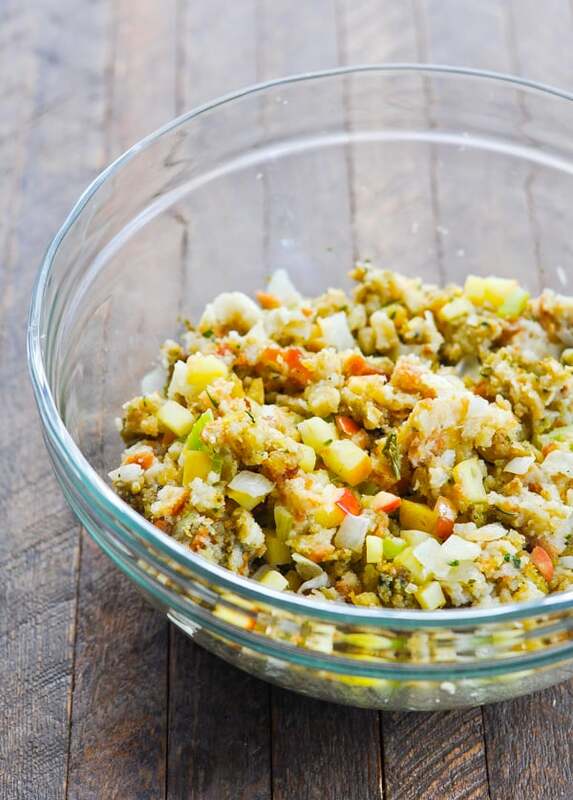 Stuffing Variations: feel free to add different ingredients to your stuffing mixture! You can make Cheese Stuffed Pork Chops by mixing in a handful of grated cheese; you can make Spinach Stuffed Pork Chops by wilting baby spinach leaves in your skillet when your vegetables are just about done cooking; and you can make Bacon Stuffed Pork Chops by cooking diced bacon in the skillet with the vegetables and adding that to the stuffing mix. In a large skillet, melt 1 tablespoon butter over medium-high heat. Add apple, onion and celery; sauté just until tender (about 5-7 minutes). Meanwhile, prepare stuffing according to package instructions. 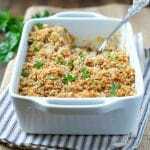 Use a fork to gently combine stuffing with apple, onion and celery mixture. Set aside. Preheat oven to 350 degrees F. Spray a large baking sheet with cooking spray and set aside. 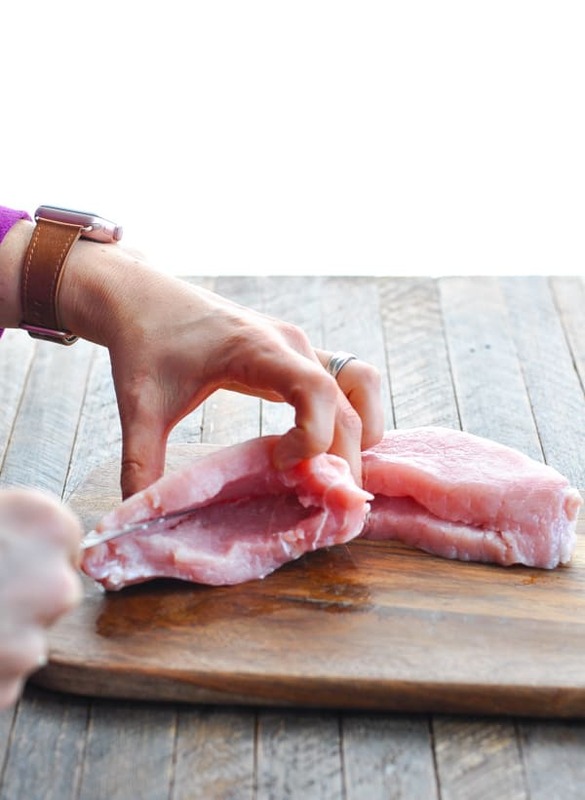 Use a sharp knife to cut a pocket in each pork chop. Fill each pork chop with about ¼ cup stuffing (or as much stuffing as you can fit inside). Secure with toothpicks. Season with salt and pepper. Place on prepared baking sheet. Bake, uncovered, for 35-40 minutes, or until juices run clear and a thermometer reads 145 degrees F. Allow to rest for 3 minutes. Remove toothpicks before serving. Oooh, what an awesome dish! This looks like a pork dish I’d actually enjoy!